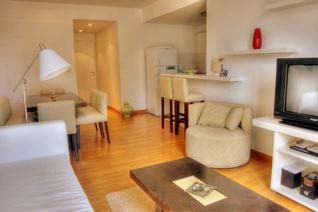 Elegant and modern split level apartment, located in Palermo area. In the first level has a large living filled with light and decorated with new furniture. It offers a comfortable sofa bed with an elegant chair and cofee table. The living has access to the balcony. The kitchen is connected to living and has a breakfast bar, there is also a dinning table with four chairs. Guest toilette. The second level offers a King size bed that can be split into two simple beds, a full bathroom with shower and tub. Split level apartment. Living with comfortable sofa bed. AC hot/cold. Cable TV, Hi Fi system. Internet. Kitchen with a refrigerator, freezer, coffee makers, toaster, dishes. Guest toilette and en-suite bathroom on the upper floor. Bed linen and towels. Balcony. BBQ Area. Gym. The building offers a terrace with BBQ area , jacuzzi pool and gym . Located in Palermo , you are in one of Buenos Aires’ most interesting neighborhoods. it is also filled with great shopping, sidewalk cafes and tempting restaurants. 1 block from Av Santa Fe, where there are several subway stations and bus stops providing access to many other parts of the city.